Listing: 1830. By James Morgan (a partner of John Nash), Classical style. Comment: Built 1823-30. The church was built to accommodate the expanding population of the town but was never entirely successful. The population in that quarter was never turned out to be as great as had been expected, the area largely turning into an industrial one - and with the abattoir not far away. 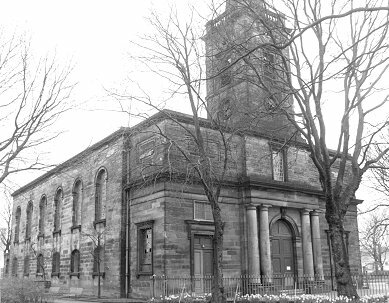 By the 1960s even that residential population had moved away, the church was closed and became dangerously derelict. Later the land around it was identified as the last area in town which could house a food superstore. Sainsbury's moved in, building their store to one side of the church, restoring the church and using its interior as the store entrance and coffee shop. An upper floor was inserted and was used as offices. The new buildings were designed in a way which was sympathetic to the old church, though the entrance canopy did not meet with universal approval. The new build also complemented the new Combined Court building on the other side of the ring road. The project was architecturally and commercially successful. The store remained, until the opening of Sainsbury's new £60m store in Raglan Street, Wolverhampton, in July 2014. The store in St. George's Parade then closed. 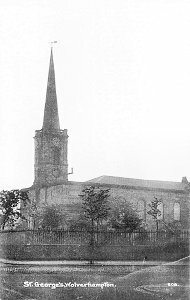 The Church in the early 1970s. Attempts to sell the store failed and plans have been made to build houses on the site. 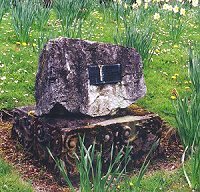 In 1986, before the building of the store and car park, the human remains in the graveyard were removed. A small number of the remains were buried at Bushbury Crematorium, but most were reburied in the graveyard beside Holy Trinity Church, Heath Town. The remains buried at Bushbury were removed in 1981 when the ring road was built. The majority of the remains were removed in 1986 before reburial at Heath Town. The small monument opposite, is in the grounds of Bushbury Crematorium. 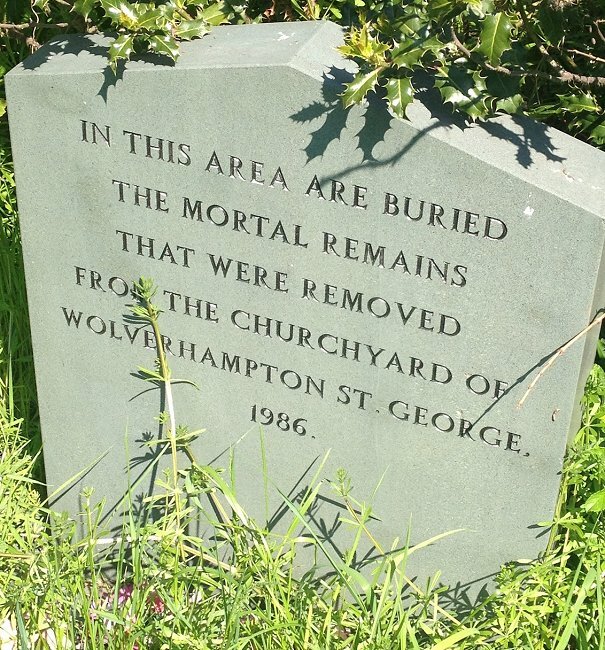 The plaque on it reads: "St. George's Churchyard November 1981. To the rear of this memorial lie the remains exhumed during the construction of the ring road". The memorial at Heath Town. Courtesy of Mike Claridge. I must thank Mike Claridge, who is Minister of The Cotteridge Church for his help with this section. In 1986 he was one of the Environmental Health Officers who supervised the exhumation of human remains from the churchyard.